You guys are definitely on to something big re: Civil Air Patrol’s corruption of our federal and local legislatures. It seems you focus on large wings (CA, FL, GA, NY), but I guess it all depends who writes in to you. So that you are aware, we have our fair share of swamp-slime here in New England too. For example, New Hampshire Wing Civil Air Patrol only very recently (late 2010s) established a State Legislative Squadron for members of the State House, Senate and Executive Council. We’ve had a lot of problems [some of which AuxBeacon has reported] and Civil Air Patrol did not have the best reputation for a long time. But in October 2017, CAP mouthpieces like Lt Col Bruce Determann were bragging that 10 of our legislators had accepted complimentary Civil Air Patrol membership and the rank of Major. What the hell? The Civil Air Patrol has pitiful pilots, embezzlers, child molesters like our infamous Alger Conger and political extremists [redacting]-up our kids so they cannot relate in the world to come. To weaken FAA, NTSB, IRS and FBI investigations, it’s like they are trying to load up the capitol and state houses with their own shills. Even if you are guilty of reckless endangerment… you can be a member of New Hampshire Wing Civil Air Patrol if you have connections our CAP bosses think they can leverage. Did I mention we’ve been through a dry spell? 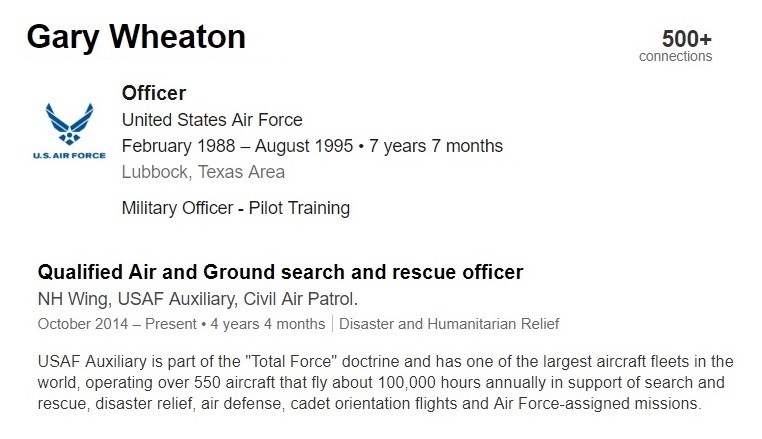 Case in point, our Civil Air Patrol cadets can learn about Gary Wheaton, a former USAF pilot at Reese AFB (1988-1995) and a former Republican member of the New Hampshire House of Representatives. On April 5th 2011, Rep. Gary Wheaton (R-Seabrook), was caught speeding and driving on a suspended license here on Route 1. He made a U-turn and went around a construction barricade when the officer tried to pull him over. The car he was driving did NOT have state representative license plates on it. Hampton police declined any on-camera interviews with our local media, calling the case “very politically sensitive.” The police informed us that there is a state statute that prevents officers from detaining or arresting a state representative en route to the Statehouse. What the hell?! Wheaton was also charged with a traffic control device violation, i.e. running a light or a sign. His license had been previously suspended on January 28th after he pled guilty to recklessly endangering the lives and safety of the public in Londonderry on September 18th 2010. That’s straight from the following court documents [link redacted]. Wheaton was originally charged with driving under the influence of liquor, but he had a restaurant receipt that showed 3 drinks in 3 hours, so he was able to plead guilty to a reduced charge. Wheaton stated that he thought the traffic stops could have possibly happened because he is a Republican who voted against collective bargaining. But he was more than willing to float that trial balloon up a flag-pole where it would later be saluted by commanders of Civil Air Patrol who allowed him to become a Qualified Air and Ground search and rescue officer from October 2014 to Present. But lo, it doesn’t end there. In late 2017, State Rep. Howard Pearl (R-Loudon) and State Rep. David Testerman (R-Franklin) were both given complimentary membership and the honorary rank of major in New Hampshire Civil Air Patrol. One of those is more interesting than the other, and it might be best to allow your readers to dig for themselves.